I absolutely love making Indian snacks and I know you will too! They can be so quick and easy, or intricate and complicated, depending on how much time you have and how much you want to challenge yourself in the kitchen. If I only have a short amount of time to whip something up, I like to make a round of Pakora or maybe a quick plate of Seekh Kebabs to fill hungry tummies. If I have a bit more time I’ll often choose to make some vegetable Samosas and a few Vada (crispy doughnuts) -both of which are firm family favourites. Indian snacks can be a great foundation to a mezze-style meal with friends they can form the cornerstone of a delicious and healthy lunchbox, or you can offer them as appetisers before an evening meal. It is also worth remembering that not all Indian snacks have to be deep fried! 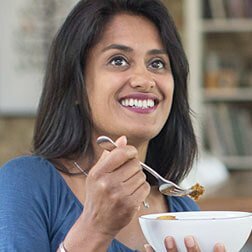 There are loads of healthy snack recipes such as fragrant jeera chicken wings or my delicious spicy courgette and pea fritters to choose from. However you chose to serve them, I’m confident your friends and family will love these tasty treats. Feel free to browse these Indian snack recipes and bookmark some of your favourites - and let me know in the comments how you're getting on!